Rainbow Lady's Challenge this week is for wheels to be included in your entry. I thought this would make a nice card for a man. Paper is Making Memories and a free paper from Making Cards Mag. Just Magnolia Challenge this week is "Buttons". I bought some new Copic pens yesterday so have been trying them out. My card today is for two challenges, Charisma Cards Challenge 28 which this week is a lovely sketch by Lyndsey and Penny Black Saturday Challenge 58 - Soft and Sweet. Extras - Prima flowers, buttons, ribbon, ladybird, pearls and sentiment. Today's card is for Rainbow Lady's Challenge 68 which is "Hats". This card was made for a monthly swap on the forum I belong to and as I know it has been received have decided to put it on here. The theme was "Hot Colours"
My card is for the Penny Black Saturday Challenge which this week was "Swirls"
Stamp - Penny Black "jump for joy!" Papers - Basic Grey "Sugared"
Extras - Sakura Gelly Glaze pens, Walnut stain Distress ink pad, branch punch, spacer, pearl, sentiment. I'm really getting into the swing of Christmas cards at the moment so here is my offering for Stamp with Fun this week which is a lovely sketch by Tina. The stamp I used is a PSX which I have had for ages, coloured with Sakura Gelly Glaze pens and highlighted with a little Stickles. The papers are all K & Co and I added some square gems and a greeting. Just managed to get this card done in time for this week's challenge at Just Magnolia, which is to use charms. I decided once again on a Christmas card, I used Tilda with a wreath and coloured with Sakura and Whispers pens. The papers are all Anna Griffin apart from the one with the script on which is from my stash, I cut the corners on the Cuttlebug with the Quickutz corner die and layered them together. I added a snowflake, greeting, ribbon and a wreath charm. At last I managed to get a tag done for Frankie's Challenge at Dragons Dream. I made the background by painting various colours of Cosmic Shimmer, and then stamping flowers from an Elusive Images set with black Versafine. I finished with some Prima flowers layered together with a spacer and pearl in the centre, I used my branch punch to add some greenery and finished with a butterfly charm and ribbon. I started this card yesterday morning before two of my granddaughters came to stay for the weekend and managed to finish it when they left today. I really need to get started on Christmas cards so was quite happy when Rainbow Lady's Challenge this week was "Christmas with a Pet". I used a Penny Black stamp coloured with Whispers and Sakura pens and edged with Brick Red distress ink pad, the papers were Daisy and Dandelion Christmas Collection. 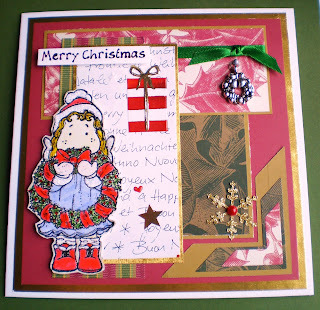 I added a Prima holly, ribbon, Father Christmas charm and greeting. As the weather is a little cooler today decided to make a card for the Truly Scrumptious Challenge, which was a sketch by Sharon and to use some neglected stamps and papers. The stamp is by Hero Arts and have not used this for a few years, I stamped in black Versafine and used some distress ink pads round the edge, the papers I think are from Dovecraft, I found them in one of my paper boxes. I cut the photo corner with a new Quickutz photo corner die, the paper flowers are from my stash with pearls added.